Fancy a family fun day out in the country? 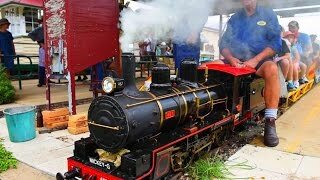 Half an hour from Ipswich you'll find the Grandchester Model Steam Railway, where train enthusiasts young and old are in their element. When you arrive, it's like the hustle and bustle of a real railway station only the locomotives are scaled down versions of actual coal burning steam engines. While you wait to board your train in front of the original signal cabin from Yarongmulu (a town on the Little Liverpool Range between Laidley and Grandchester circa. 1866), you'll see the train drivers busily stoking the coal, topping up the water, releasing the steam and blowing their whistles, ready to go on the green traffic light. This attraction is open on the first Sunday of the month and if you're planning to ride the trains, please make sure you wear fully enclosed shoes. Indicative Prices $2 - $2 To ride on model trains.